Give your M3 a boost in power while retaining your stock airbox. 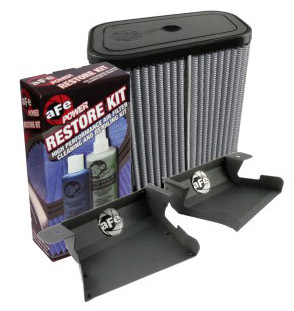 The AFE Super Stock Intake System utilizes your existing air box and replaces your stock air filter with an AFE filter. The air scoops allow more air to enter your engine bay thus keeping air intake temperatures down. AFE filters are constructed from 100% polyurethane which makes them very durable, and resistant to high temperatures and chemicals. The construction of the pleats in the filter is deeper than that of any other filter, this provides for an increased flow and prevents a greater amount of dust from reaching your engine. 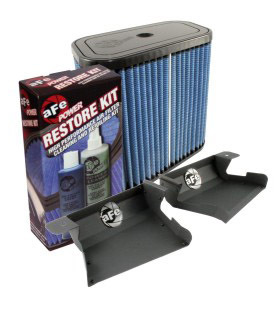 The AFE intake system increases airflow 54% over stock allowing for a nearly un-restricted airflow, maximizing power gains. The dyno proven gains show an increase of 6 horsepower and 8 Ft/lbs. of torque at the rear wheels.